The team of Professor Keon Jae Lee (Department of Materials Science and Engineering, KAIST) has developed fully functional flexible non-volatile resistive random access memory (RRAM) where a memory cell can be randomly accessed, written, and erased on a plastic substrate. Memory is an essential part in electronic systems, as it is used for data processing, information storage and communication with external devices. 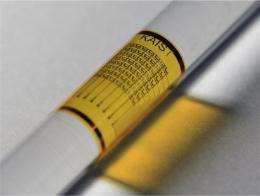 Therefore, the development of flexible memory has been a challenge to the realization of flexible electronics. Although several flexible memory materials have been reported, these devices could not overcome cell-to-cell interference due to their structural and material limitations. In order to solve this problem, switching elements such as transistors must be integrated with the memory elements. Unfortunately, most transistors built on plastic substrates (e.g., organic/oxide transistors) are not capable of achieving the sufficient performance level with which to drive conventional memory. For this reason, random access memory operation on a flexible substrate has not been realized thus far. Recently, Prof. Lee's research team developed a fully functional flexible memory that is not affected by cell-to-cell interference. They solved the cell-to-cell interference issue by integrating a memristor (a recently spotlighted memory material as next-generation memory elements) with a high-performance single-crystal silicon transistor on flexible substrates. Utilizing these two advanced technologies, they successfully demonstrated that all memory functions in a matrix memory array (writing/reading/erasing) worked perfectly. Prof. Lee said, "This result represents an exciting technology with the strong potential to realize all flexible electronic systems for the development of a freely bendable and attachable computer in the near future." This result was published in the October online issue of the Nano Letters ACS journal.